Description: Snacking on a cold treat is a great way to beat the heat this Summer. When it's hot outside, retire the oven and use your skills to prepare a cool chocolate pudding pie instead of baking. 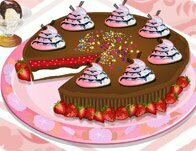 Fresh whipped cream makes the perfect topping for this crunchy graham cracker crust and creamy chocolate pudding pie, so follow the instructions and stick to the recipe to prepare the perfect summertime dessert in this fun online cooking game for girls! Instructions: Follow the in-game instructions and use your mouse to prepare the chocolate cream pie!